In addition to those points, many pregnant women struggle to get a good night of sleep as they get farther and farther into the process. For that reason, an entire market has developed with the goal of making the expectant mother as comfortable and relaxed as possible at night. If you're in a hurry check out the Leachco Snoogle Total: Simple, affordable option for restful nights during maternity. 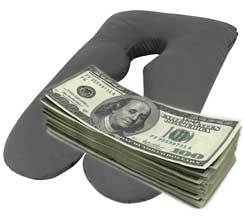 Without further delay, let’s get down to the business of finding you the perfect maternity pillow! One of the top maternity pillow options on the market, the Snoogle Total Body Pillow from Leachco has a modest price point, great reviews, and plenty of beneficial features. 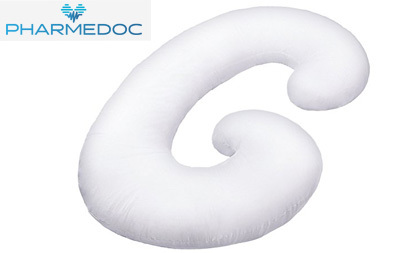 This is a ‘C’ shaped pillow which can actually be used at any time, as it is not specifically meant only for pregnancy. It does excel at that job, however, as it wraps around your body from your head down to between your legs. The design leaves space for your growing belly, and the cover can be removed and machine washed. A quick scan of the reviews which have been left for this pillow reveals that most buyers love their Snoogle. It is noted that it works nicely for both pregnant and non-pregnant individuals, meaning you may keep getting value from your purchase long after your child has been born. The Leachco Snoogle hits on all of the key points that you should be looking for, making it a leader in this market. This is a very good pillow from Today’s Mom. Right from the start, it is important to state that this is not a small pillow. Rather, it is huge. This model wraps around both sides of the sleeper, meaning it is going to take up a large portion of your bed. If you sleep with someone else in your bed each night, and you don’t have a King bed, you might quickly run out of space. With that said, the sheer size of this pillow will provide great support, so you may find you can sleep better than ever before once you get used to this style of pillow. So, again here, you may be able to get use out of this pillow even when the pregnancy has been completed. 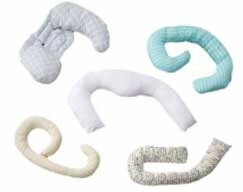 Another great and affordable ‘C’ shaped cotton maternity pillow. This is another product which has been used by many women previously. Thanks to the wrap-around design, you can support your head and neck, back, hips, knees, and more all with a single pillow. This model is not as bulky as some of the others on our list, so it may be a more reasonable option for those who don’t have a big bed to share with their partner. The cover of this pillow is 100% cotton, and it comes with a five-year warranty. 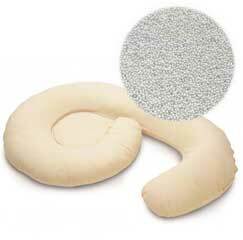 As is the case with most of the pillows we have listed, this pillow has collected a long list of positive reviews. 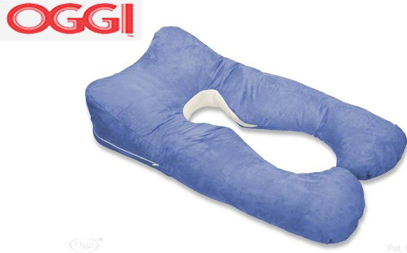 Among the compliments paid to this product include the maneuverability of the pillow, its overall comfort, and the way the case can be removed easily for wash.
Next up, from Oggi, has a unique belly contoured shape which offers support specifically for the belly of the pregnant sleeper. There is a curve within the side of the pillow that should fit your belly nicely, and the curve on the other side is meant to likewise support your back as you rest. This is another one of the large products of this type on the market, so you will need to have plenty of bed space to make this work. Also, the Oggi is significantly more expensive than the rest of the options on our list, so be sure that this option is going to fit in your budget. You should keep this pillow on your list of potential options, but be sure to check into more affordable ones before making your selection and placing an order. This one falls into the ‘U’-shaped category, meaning it is meant to wrap around your body from the top down. You can lay your head directly, and then use it also to support your belly and back. 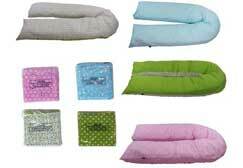 The pillow has a 100% cotton cover, and the cover can be easily removed and washed. With a reasonable price tag that falls in line with many of the products in this market, you should keep the S2BMOM Total Body in mind as you shop. While there are plenty of positive reviews for this product, the comments of past buyers are not quite as unanimous as they are with some of the other market options. Some users are happy with the comfort, and the way it has helped them sleep, but others express concern about how much filling is included in the product. The comments of some owners are positive enough to keep this pillow on your list, but there are plenty of others that deserve attention as well. The reviews which have been left for this simple pillow are incredibly positive. 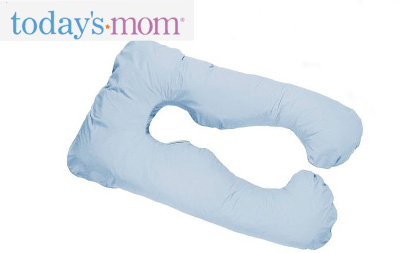 This is one of the best-reviewed pillows for maternity you will find – or anything else for that matter – which is reason enough to give it your attention. This pillow from Lavish Home is another that is not meant specifically for pregnant women, as it can be used as a body pillow by anyone looking for a more comfortable night sleep. For those who are pregnant, it offers nice support for both the back and belly. It has a removable cover which is machine washable, and the filling is polyester hollow fiber. The price which you will find on this product comes in on the lower end of the scale for most of the products we have reviews. The affordable price point should keep this pillow somewhere on your shopping list, but it is likely that you will settle on another one of our many worthy options. While the idea of purchasing a good pregnancy pillow may have you excited about the possibility of improved sleep, it would be a mistake to rush out and buy the first one you can find. There is a tremendous amount of variety in this market, which is why you need to think about the features that you need most. Following is a list of some of the main points you need to check on before you buy. Simply put, some pregnancy pillows are downright huge. If you sleep with a partner in something less than a King bed, you might find that you quickly run out of room after you add a large pillow to the equation. Fortunately, there are compact options available as well, so think about what size pillow is going to work for your situation. Opt for larger ones if you want maximum support and have plenty of room to spare. If space is at a premium, however, go for a smaller option that can still give you some of the support you need. While sleep is extremely important during pregnancy, you still don’t want to have to break the bank on this purchase. 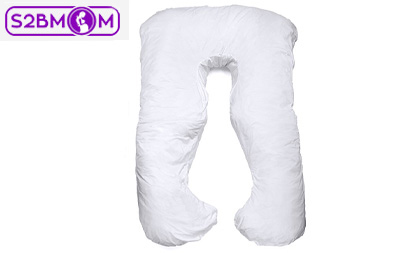 If this is going to be your only pregnancy, you may not use this pillow again after these few months – and even if you do have other children, you will only use the it few months at a time during those pregnancies. That isn't to say that you should buy the cheapest one you can find, but you should at least be aware of how much you are going to have to invest. Finding a product that balances quality with cost is the best bet when shopping in this market. Washing the cover of your pillow from time to time is a great way to prevent it from picking up undesirable odors, so having a cover that is easily removed and replaced is a great feature. First, you will notice back support that may help you be more comfortable while trying to sleep. The changing shape of your body during pregnancy may make it tough to get comfortable on your side, which is the suggested sleeping position for pregnant women. However, you may have an easier time settling in if you use the pillow for a pregnant woman. Have you started snoring? If so, you may find that it can help to eliminate that issue – which is something your partner will surely appreciate. There is no guarantee that it's is going to take away your snoring habit, but it certainly could help you stay quiet through the night. Overall, it is well-suited to your body should help you to relax and sleep more comfortably through the night. If you have been struggling to sleep well up to this point, you just might come to think of your new pillow as one of your best friends. You should be happy and excited during your maternity period, as you wait for the arrival of the new addition to your family. However, it is hard to be in a good mood when you can’t get a solid night of sleep. 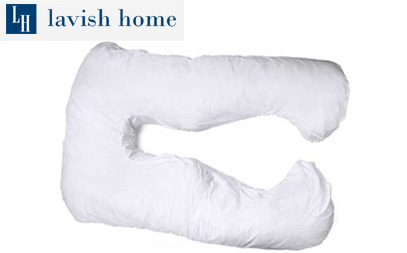 We hope that we managed to help you find the best maternity pillow for your needs. 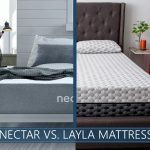 While you are at it, you might need a brand new crib mattress for your newborn, so check out some of the reviews, your baby will sleep better and so will you. Respiration during sleep in pregnancy. Leachco snoogle is my best buddy! Thank you for sharing this wonderful alternative. helps me very much.